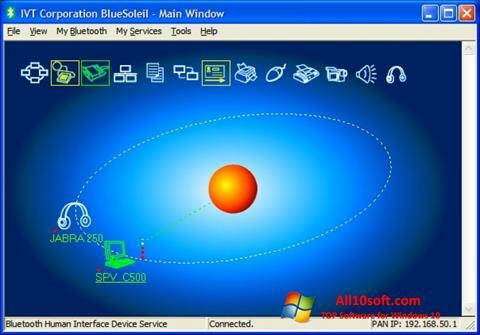 BlueSoleil for Windows 10 - a small program that is an indispensable tool for organizing a stable working connection between personal computers, mobile devices, printers, other technology with Bluetooth technology. The software is a multifunctional application that can be used at home, in offices. It is convenient to work with the utility: each function is distinguished by a brief explanation of use. With the help of software you can quickly synchronize portable devices with a computer, organize a wireless network using Bluetooth technology between several PCs. You can free download BlueSoleil official latest version for Windows 10 in English.